MOSCOW, July 11. /TASS/. Japan’s strict position created obstacles for successful cooperation with North Korea in the future and intensified the conflict over denuclearization on the Korean Peninsula, expert from the Russian Institute for Strategic Studies Yuliya Kryachkina said on Wednesday. "Tokyo has introduced such a far-reaching sanctions regime against Pyongyang which made negotiations impossible. The Land of the Rising Sun closed the door to further cooperation, having no communication channels, having cut transport communication, visa issuance and so on and insisting on the preservation of this regime," the expert said. She highlighted that the position of Japan’s authorities is linked to the pending issue of the Japanese citizens who were abducted in the 1970-1980s by North Korean intelligence services. Still, Tokyo’s actions to introduce economic sanctions against Pyongyang make it impossible for the countries to approach the agreement on the specified issue. 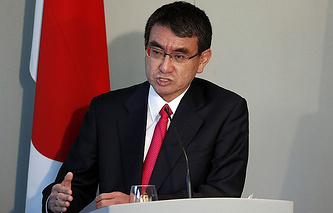 "Shinzo Abe’s government brings this problem to the level of denuclearization by its importance. This position makes his American partners constantly raise this issue in their dialogue with North Korea, which provokes Pyongyang to negatively treat negotiations," Kryachkina explained. US Secretary of State Michael Pompeo positively responded about the results of his recent trip to North Korea. However, North Korea’s leadership took the opposite stance, calling the demands of the United States "robbery" and saying that the denuclearization process could be scaled back, the expert said. Kryachkina presented the information which shows that skepticism over the emerged controversies is widespread among Japanese politicians and citizens. "Recent polls suggest that around 83% of respondents do not believe that the denuclearization will be completed in the period announced by the US top officials. It creates certain sentiments in the political elite," she noted. "For Japan the situation regarding the North Korean threat remains, in fact, the way it was a year ago, maybe a little easier due to the start of negotiations," the expert concluded. On July 8, Tokyo hosted negotiations between the foreign ministers of the US, Japan and South Korea. Pompeo had earlier come to Pyongyang on a two-day visit, where he discussed regional denuclearization issues with North Korea’s leadership.